25U25 – 2018 Class – Page 2 – UNITY, Inc. 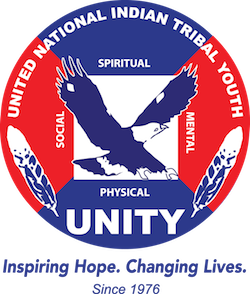 The Navajo Nation Youth Advisory Council (NNYAC), which was formed just three months ago, is exploring ways to partner with UNITY including becoming an affiliated youth council. The group, with youth members representing chapters across the reservation, meets once a month. For its recent presentation in Window Rock, Arizona,, UNITY was well-represented with former National UNITY Council Executive Committee Co-President Nataanii Hatathlie, 25 Under 25 youth leader Xavier Medina and UNITY’s executive director Mary Kim Titla. UNITY 25 Under 25 awardee Jazmine Wildcat, 14, Northern Arapaho, Wyoming reflects on her experience at the annual youth celebration on August 2nd at the Wind River Hotel and Casino. For over ten years, the Northern Arapaho Tribe has given thousands of backpacks filled with school supplies to students who attend their free carnival. All Fremont County K-12 are invited to attend where other activities included a free barbecue, inflatable bounce houses and special guests Chance Rush and Emcee One. UNITY 25 Under 25 Honoree Vonica LaPlante, 17 of the Mandan, Hidatsa and Arikara Nation, awarded a MHS Champions for Change! Vonica was also accompanied by former UNITY Executive Committee Northeast Representative and former UNITY 25 Under 25 honoree Brayden White, to accept this prestigious award.